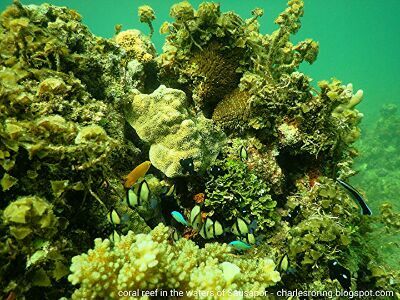 Coral reef is a sea environment that is rich in marine life. A lot of species of fish and other marine creatures live there. Some of them include: surgeonfish, lionfish, anemonefish, parrotfish, wrasse, moorish idol, grouper, butterflyfish, boxfish, and a lot more. There are also nudibranch, sea stars, urchin and sea cucumber. They become important marine attractions for visitors who are interested in enjoying snorkeling, scuba diving and freediving. There are several snorkeling sites in the coastal area of Tambrauw regency located between Sorong and Manokwari which tourists can explore. I personally have organized a number of snorkeling and rainforest tours in the regency for visitors who come from Luxemburg, Germany, France, the Netherlands, and New Zealand. 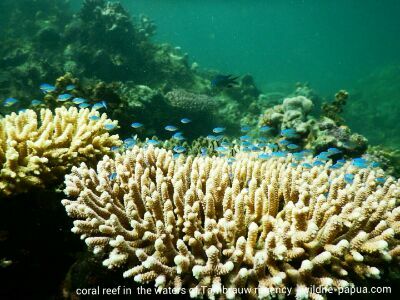 Visitors need to bring their own snorkeling masks and underwater cameras such as Canon Powershot D30 and Nikon AW 130 if they want to see and take pictures of fish and coral reef in Tambrauw. Because coral reef is a rich but fragile marine environment, tourists and guides who do their activities in coral reef areas must follow certain standard rules such as not standing on corals, not harrassing marine animals and not poluting the environment with wastes especially with plastic and toxic and other harmful materials that are bad for the environment. Tambrauw regency is located in the northern part of Vogelkop region of West Papua. Its coastal area is facing the Pacific Ocean. The sea is calm in April, May, June, July, August, September and early October. It is the time for marine lovers and beach goers to enjoy swimming, snorkeling and freediving. There are no recreational scuba diving operators in this regency. So visitors need to bring their own equipments if they want to explore the underwater world of this regency. There are two islands near Sausapor town (formerly called Sansapor). Their names are Efwe island and Efnay island (formerly called Amsterdam and Middleburg islands). They are surrounded by coral reef and rich marine life. During World War II, the American forces built airstrips in one of this island and on the mainland to fight the Japanese forces. After the war US troops scuttled boats and other marine vehicles that they did not use anymore into the sea. Now they become house sfor fish and lots of marine animals. Tambrauw is one of the best sites in the world for Turtle Watching. Leatherback turtles (Dermochelys coriacea) lay eggs at Jen Womom beach of Tambrauw. It is one of the most important nesting sites for the largest turtle in the world. As a matter of fact, there are other turtles that also choose Tambrauw beach as their nesting sites such as the Hawksbill (Eretmochelys imbricata), and Olive Ridley (Lepidochelys olivacea). To watch turtles laying eggs at nights, visitors need to bring their own torches that emit red light. This can easily be done by adding a red plastic film to the glass cover of the torch. This tour is combined with camping, riverwalk, birding and wildlife watching tour in the forest. If you are thinking of taking a holiday in tropical region, Tambrauw can be a good choice. Please, contact me (Charles Roring) by e-mail to: peace4wp@gmail.com or send text message to my whatsapp number: +6281332245180.